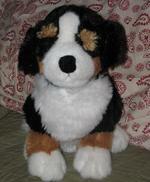 Adoption Info | Bernese Auction Rescue Coalition, Inc.
Are You Looking for the Perfect Dog? Well, look no further. This Bernese Mountain Dog does not shed, does not bark, does not drool, is housebroken, does not need a fenced yard, does not need to be walked, does not need to be fed and watered, does not require expensive medical care, does not dig, needs no training and can be left alone for hours on end. Guaranteed. Ok, this is a joke. Of course you don’t get the Berner kisses, the Berner handshakes, the Berner smiles, those Berner eyes, a big fuzzy foot warmer in the winter or all of the love your heart can hold. Please remember, dogs are not perfect, just like humans. With each accomplishment and every milestone conquered, you and your rescue Berner will become closer and your bond deeper. Guaranteed. Please choose a menu option at the top of the screen for more details about adopting. We still need your help! You can support BARC, Inc. with a donation. You will be adding your voice to our call for changes to the law, and by shopping from vendors who support BARC, Inc. Join Us!